One of the popular methods to take a screenshot of a specific web page is using 'Print Screen' key ( PrtScn) but it does have a limitation. It will not show the entire web page but just the portion which is on the screen. Google Chrome has a solution for it and can take a full page screenshot of any web page. This can be done with the help of an extension named "Web Page Screenshot ". It is a Google Chrome extension and does not work with other browsers. If you try to install this App on Firefox or Internet Explorer, it will not work. This article explains how to install this plugin and take full page picture of any website. This extension lets us take the full page screenshot of any web page which is opened in Chrome browser. The image can be saved in JPEG or PNG format. To download this extension, visit the following link. On this webpage, you will see one download link for Web-page Screenshot. You need to click on the install button to install this App on your browser. It may give you an alert where this extension can access your private data stored. If you don't allow it, the installation process will not complete. After allowing it, this plugin will be installed. Now let us check how to take the full webpage picture by this App. You may follow the instructions provided below. You can see a camera symbol on the right-hand side of the chrome address bar. You should click on that button to take the screenshot of the webpage loaded in Google Chrome browser. It may take a little time to load the entire image on the App depends on the webpage size. If the website is big, it will ask us to wait until it creates the image file. Just one click is enough to capture the full website loaded in the browser. The screenshot of the website which is taken by Google Chrome would look like below. 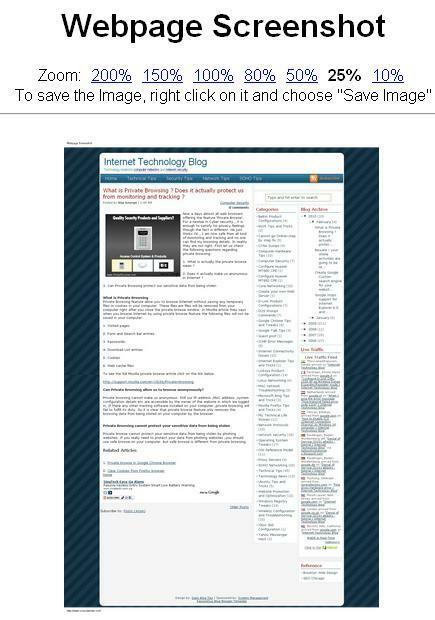 It is the screenshot of this blog taken using this plug-in. We can control the size of the webpage photo taken by Google Chrome browser using the Zoom feature. We can Zoom Out and Zoom In the picture and adjust the size of the image according to the available options and save it. Very useful chrome extension. Simple yet powerful. Highly recommended.